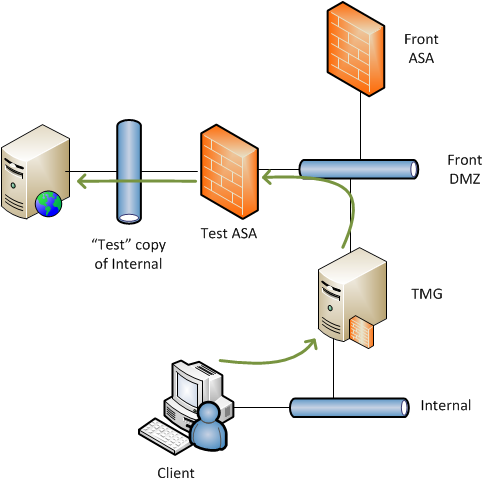 In most scenarios with TMG / ISA you have a front firewall of some description and then your TMG at the back end. 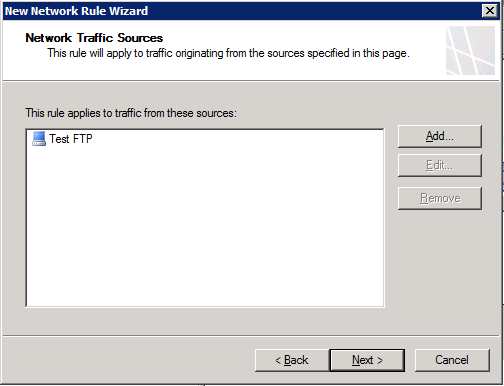 In this scenario typically when you want to publish a service (lets say FTP) to the internet it’s normally not an issue, you NAT the connection from the internet to an IP on the outside of the TMG and then you create a server publishing rule to pass that back through to the internal server that’s hosting the service, job done. 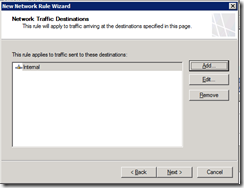 However in our case we wanted to publish a service on the internal interface of the TMG for something that existed in the DMZ network in front of the TMG. 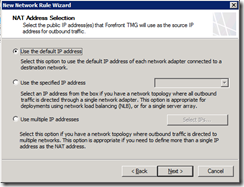 This was a range that wasn’t explicitly defined and so was classed as being in the “external” network range. This might seem like a weird thing to want to do, however there is quite a good reason. In our case there was an isolated “test network” used by the client as a replica of their live kit for testing purposes. 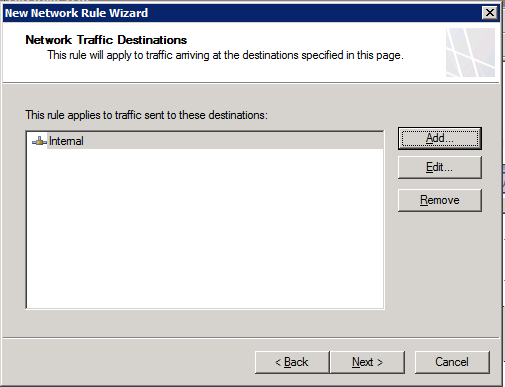 In order to ensure total isolation this test network was protected by it’s own Cisco ASA firewall and neither network knew about each other as all traffic in and out was NAT’ed meaning that nothing could talk directly to or from the test network. 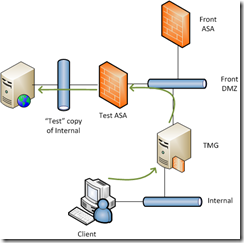 However we needed a way of gaining access to certain resources in the test network. 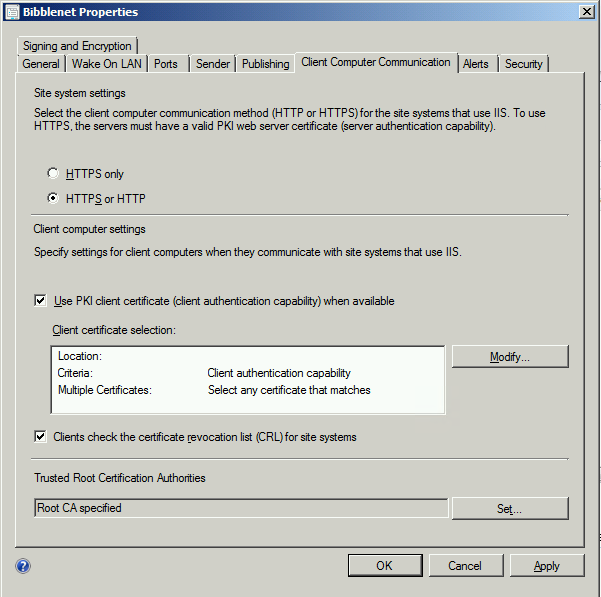 At first this was fairly straight forward to achieve using RDP over HTTPS (TS / RDS Gateway) and this worked first time perfectly. 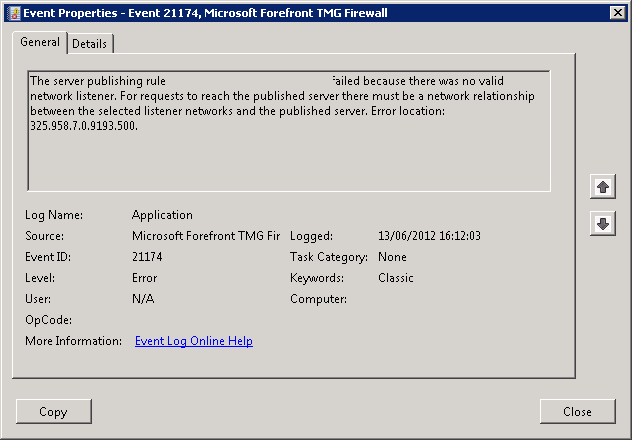 The trouble started when we tried to add FTP access into the mix. 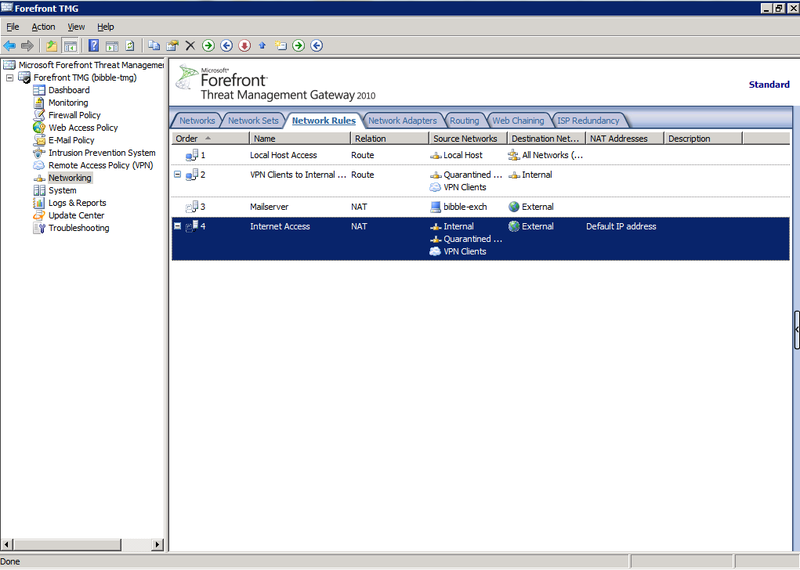 In the diagram each green line represents a separate connection so the client was only talking to the TMG, the TMG talking to the DMZ ASA and the ASA talking to the destination server. We already had a explicit relationship defined between the two networks… and then to add to the mystery this was already good enough for publishing HTTP protocols between the exact same IP’s but apparently TMG handles non-HTTP traffic in a different way (I assume due to it’s built in proxy). 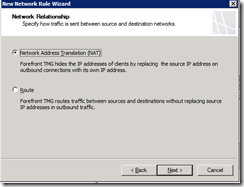 Well the solution turns out to be a bit weird, you need to create a new network relationship between the destination and source networks. 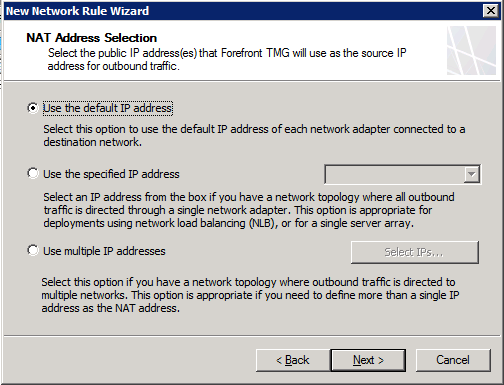 Now thankfully in TMG you can do this just between specific IP’s or computer objects rather than having to choose entire subnets or network ranges. The other thing we discovered is that the direction of the relationship REALLY matters. i.e for server publishing NATing “Internal” to “External” isn’t the same thing as NATing “External” to “Internal”. 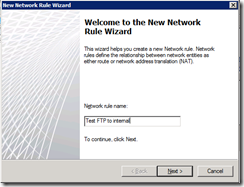 After checking that the new network rule configuration has applied (or just wait 5 minutes) disable and re-enable your non-functional server publishing rule and this time you should see your TMG start to pass traffic through correctly and a quick check of the listening ports will show it waiting for connections on your selected interface. 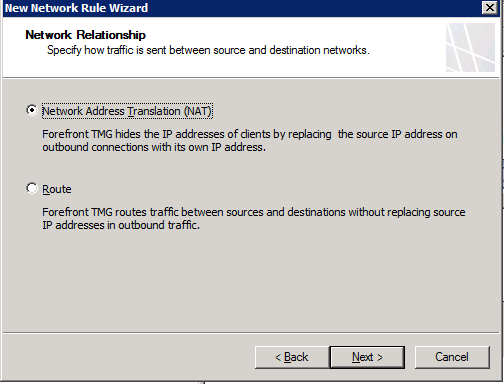 To make TMG publish non-HTTP protocols on any interface other than External then make sure you define a specific NAT network relationship (even if it’s already covered by an existing “external” NAT rule) using the remote server as the “Source” and the listening network as the “Destination”! I have recreated the error and tested this fix in a similar scenario by publishing an external FTP server from the internal interface of my TMG, same error – same fix. I’m aware this post is a bit long winded so please feel free to drop me any comments below and I can clarify where things might be ambiguous. Again thanks to Nat for his patience and perseverance. 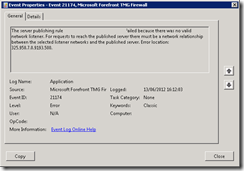 you mentioned that the trick also works for external servers “published” to the internal network. 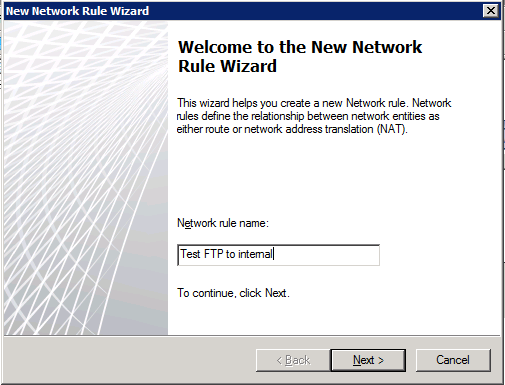 I am trying to make an external FTP server accessible for internal clients by publishing, and also configured the NAT relationship as described above, but access does not work 🙁 TMG listens on the internal IP and port 21, but the diagnostic log says that the client packet does not hit the publishing rule but an access rule below the publishing rule. Can you help, e.g. provide the publishing rule used? Sorry I’ve been away on holiday for a few weeks. If you want to mail me some more info & screenshots of the rules / NAT rule then I can take a look with you?